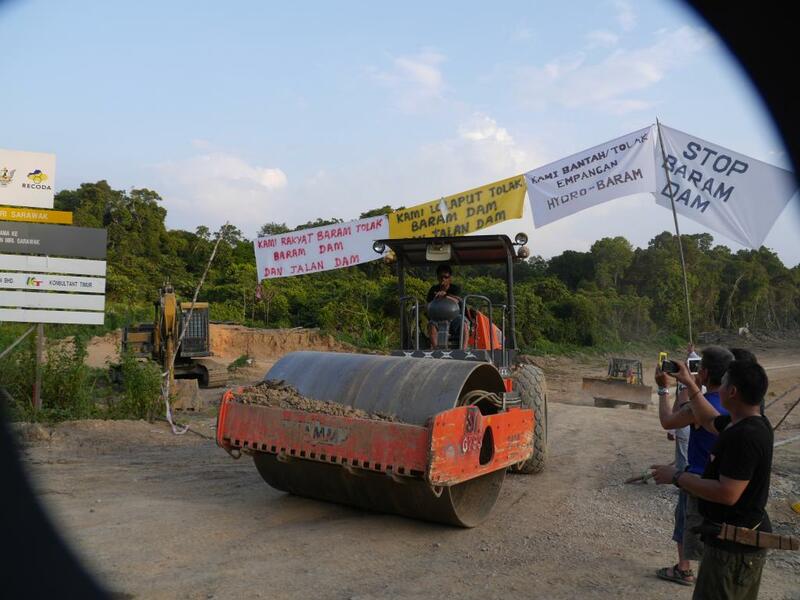 And it is understood that the local Assemblyman Denis Ngau had urged Sarawak Energy to step back from its aggressive implementation of the project in the face of the swelling anger amongst his constituents. On the other hand, Ngau has sparked fury for suggesting that local rejection of the plans was owing to “ignorant” villagers being “hoodwinked and swayed by so-called human rights organisations and NGOs”. “I do not know whether you are serious about giving out these comments or you are purely joking, or perhaps bluntly repeating what other BN politician (Lake’ Ja’au Taib) often says? There is also clear concern that this attempt at a so-called “cooling off period” is merely a tactical retreat, while politicians do the Chief Minister’s bidding in trying to buy off certain members of the communities and undermine the leading figures in the protest. 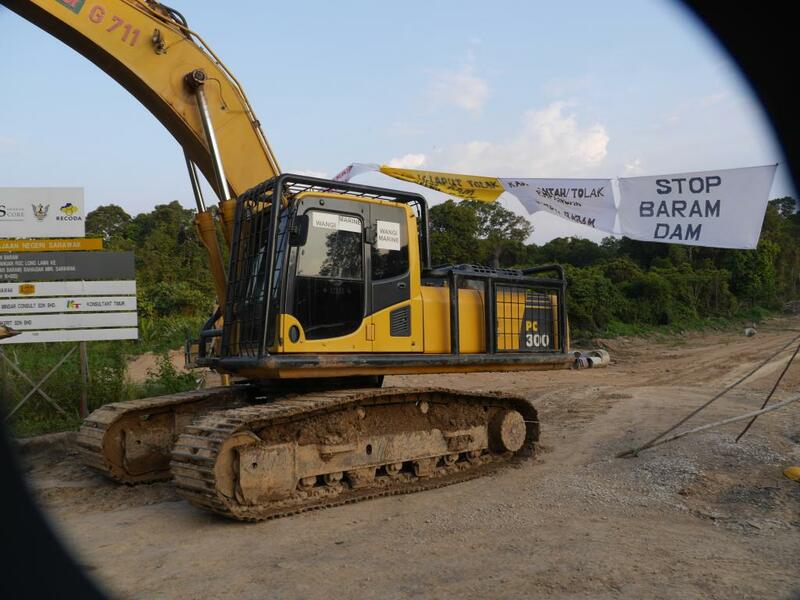 The first reported retreat by SEB workers came on Thursday 25th October, when a team of some 30 geologists arrived at the main dam site in Na’h in the Upper Baram region to conduct a rock study on the area. Locals confronted the team and told them to leave immediately. 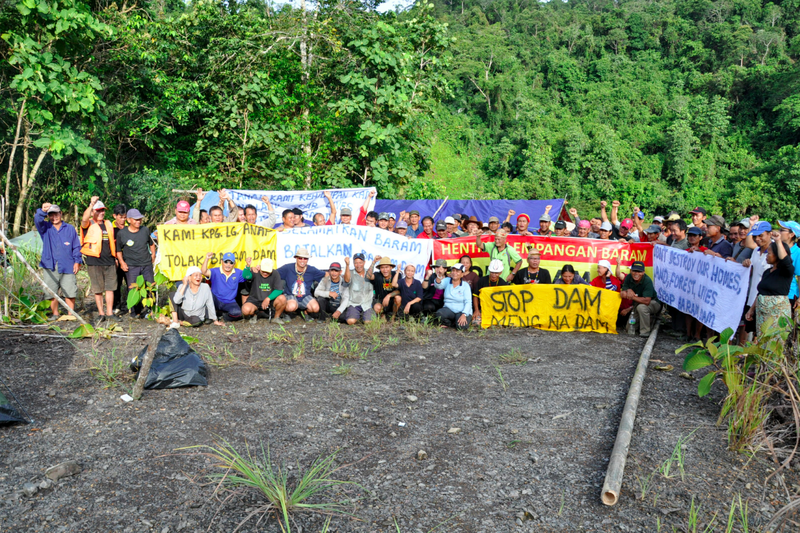 The geologists, who had set up camp, at first requested to negotiate and then time to remove their equipment, but the local people said they wanted no negotiation since they had received no satisfaction from SEB and do not want the dam. 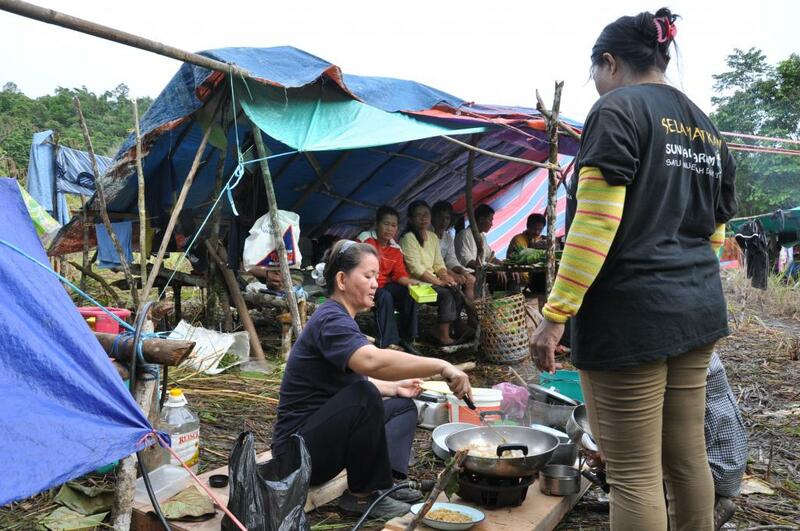 The team therefore left immediately without their equipment and the local people have reportedly let down the tents and covered the abandoned equipment, such as chainsaws and TV sets, with the canvass, secured by rocks to protect it from the rain and wind. No decision made? Stop the hoodwinking attempts, since natives are not fooled. This withdrawal was matched a few days later by the abandonment of works by some 30 Land & Survey Department staff, accompanied by 14 armed police, who had moved into the lower access road site in Middle Baram, near Long Lama. Despite threats of arrest by the police, the locals of Long Lama immediately responded with a determined blockade, manned by up to 100 local people at all times. As Ngau put it, the situation grew “very hot” and he was becoming fearful of confrontation (and doubtless the effects on his own popularity for supporting the dam). All the personnel and police protection have now also left. Only one remaining item of heavy machinery reportedly remains, owing to suspected engine problems. It should be noted that this team of workers in Long Lama had represented only an advance contingent for the site. Accommodation has already been partly constructed for an army of further workers, who are due to work on building the access road to the dam. These works (another contract that appears to have been handed to one of the Chief Minister’s many interested companies PPES) have also now apparently been suspended. 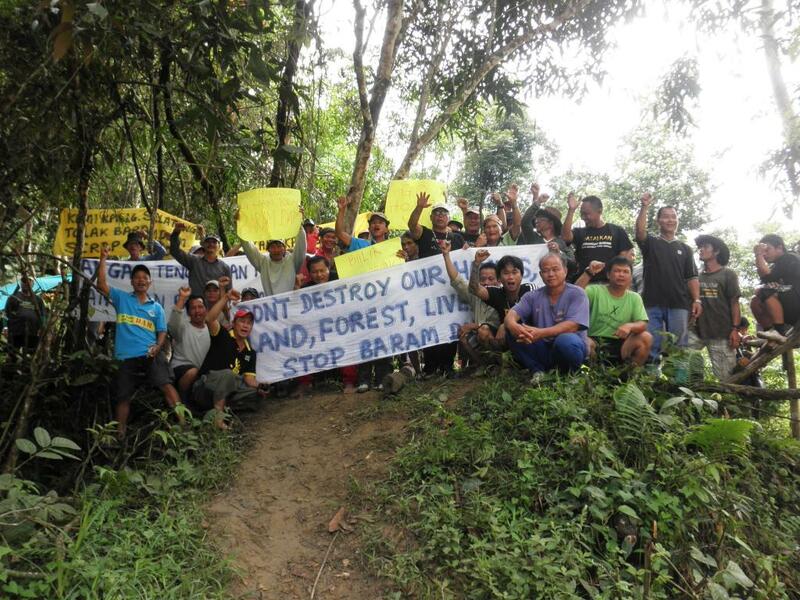 One other positive victory for the locals came when a group of loggers was detained last week, who at first denied they were linked to Sarawak Energy. They claimed they were merely operating a timber licence. However, when challenged to show their maps and licence the workers produced a map with a large SEB logo on it and details of the planned access road to the dam. 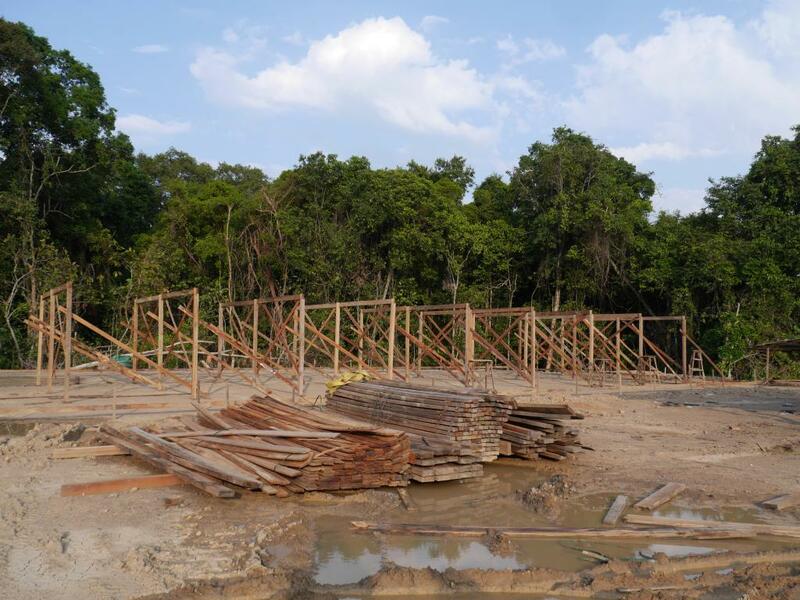 It emerged that the loggers had indeed been contracted by SEB to extract the marketable timber from the road site in advance of the construction work. 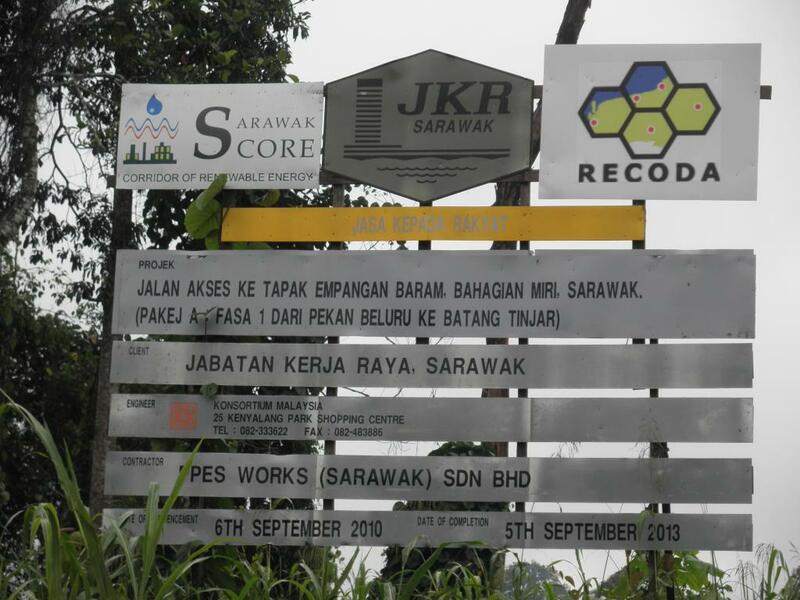 It should be noted that these events were all taking place in Sarawak at the exact same time that representatives from the State Government and Sarawak Energy were claiming at the United Nations in Geneva that they were fully respecting indigenous rights and international dam building protocols and had not yet started on any such projects. Sarawak Energy released press statements to back up these claims, again alleging the whole project is merely under consideration. 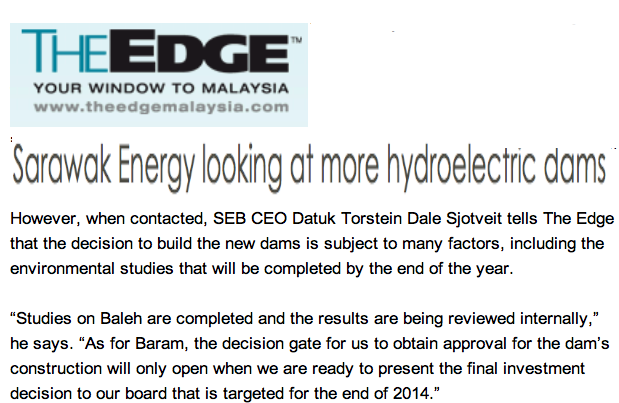 And the newly promoted Datuk Norwegian, SEB CEO Torstein Sjotveit, claimed in Malaysia’s leading business paper that no go ahead would be given for the Baram dam before it was ‘approved’ in late 2014! Pending investment decision? So what has SEB borrowed 15 billion ringgit for? The Chief Executive Officer, who has been handing hundreds of millions of ringgit worth of investments to his boss Taib Mahmud’s various family firms (including construction work to PPES already on the preparations underway for the Baram Dam) is also on record for denying that SEB has in fact already raised an enormous loan of RM15Billion for such projects. 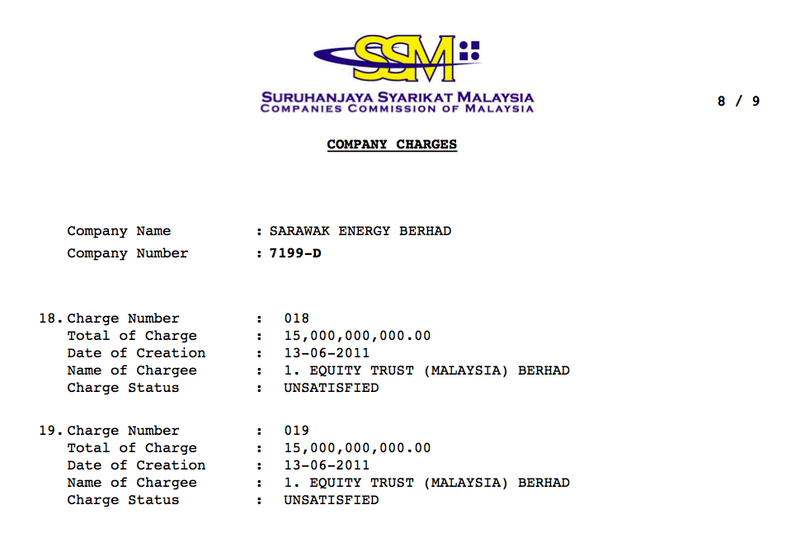 Proof of the loan is in Malaysia’s official Register of Company Records, available to the public to see, despite the fact that Sarawak Energy has not issued its own Financial Statement/Annual Report to the public since 2010. So much for the ‘best practices’ introduced by its Norwegian CEO! SEB’s enormous off-shore “Islamic” loan was raised through a shadowy wealth management company rather than a major bank. Equity Trust also manages much of the Taib family investment interests in the British Virgin Islands. It is perhaps no coincidence therefore that Sarawak Energy announced at the UN that it had drawn lessons from a recent trip to Laos, where a highly destructive and controversial dam project is also currently underway. Sarawak natives are unlikely to be reassured that the state’s Norwegian energy boss is taking lessons from Laos on the management Human Rights. They have also made clear they are not in a mood to be ‘hoodwinked’ after all. However, in this case it is SEB and Taib’s political side-kicks who are doing the hoodwinking, not NGOs.